Nothing quite represents a kitchen cleaner better than the smell of lemon zest in my opinion. But now, Zoflora have finally created Lemon Zing to join their extensive fragrances of disinfectant solutions. I was kindly sent a bottle of Lavender Escape and Lemon Zing to add to my collection to try in return for this review. What is Zoflora and how can it be used? Zoflora is a concentrated fragranced disinfectant which has a multitude of uses, from taps to drains, even potties. Pour one capful of the solution into a trigger spray bottle and top up with water for an easy to use spray cleaner. It is excellent value for money. One 250ml bottle of concentrated Zoflora disinfectant will create 25 trigger spray bottles worth of solution! When you buy a bottle in Poundland or B&M then this is a very cost-effective way at keeping your house free from 99.9% of bacteria and viruses, including Rotavirus, Influenza H1N1 to name a few. We are in cold and flu season now, so it is an ideal addition to your household cleaning good. You can use it neat, such as down basin plug holes to prevent odours and as a mopping solution,even on hard surface pet areas. Have a look at the Zoflora website to see examples of other uses depending on the room in the house. I particularly like filling up the middle half bowl of my kitchen sink with some hot water with a capful of Zoflora and leaving it overnight. I haven't really found a bottle which fragrance lasts as long as it says it should, so I will see if Lemon Zing does indeed provide "all day freshness". It certainly eliminates odours with it's fresh citrusy notes combined with spicy ginger. 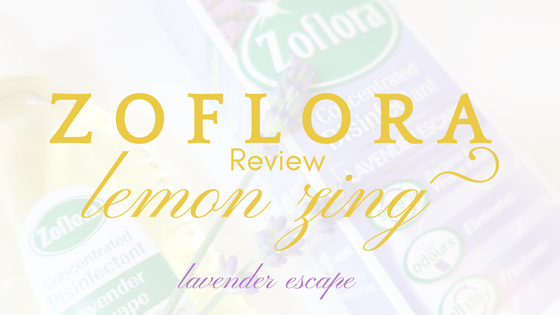 Some Zoflora users may believe that Lemon Zing has been a long time coming and I'm sure it will be up there as a faithful favourite. The packaging is lovely and even features a scratch and sniff label to give an idea of the fragrance. Not sure that will stop potential buyers from unscrewing the lid of the bottle to inhale though! I asked some fellow bloggers who are also Zoflora enthusiasts what their current Zoflora fragrance is plus if they could have any scent they wanted, what would it be? "I am enjoying Bouquet at the moment but I would love something like baby powder, that would be awesome!" "Linen Fresh is my favourite but I'd love a baby powder one for my bathroom and maybe a nice sweet one for my kitchen like caramel or butterscotch!" Beth, from Twinderelmo says "I love Twilight Garden as it seems to last the longest. I'd love a doughnut smell one." Sophie, from Soph-obsessed loves Flower Shop but would like a pumpkin spice one too, which would save her some money as her house is filled with pumpkin spice candles. Well, it is the Autumnal scent, isn't it? Rachel, from Coffee, Cake, Kids has just finished a bottle of Winter Spice which she thought was lush, just like Christmas in a bottle. She plans on finding more, especially the lemon one. Hopefully you get your hands on a bottle soon! "I love Bouquet at the moment! I'd love a Passion fruit or Coconut one!" Elaine from Lainy Loves Interiors thinks that Country Garden is her fave and would rather love lime and bergamot. Rachael From Rachael Claire loves Lavender Escape and Lemon Zing but if she had to choose any scent it would be mango and passionfruit. Kayleigh from Little B and Me loves Linen Fresh and wishes the smell would last longer, and also loves Lavender Escape which she feels lasts longer. "For me it has got to be Hyacinth but I'd love a Jasmine inspired one." "I absolutely adore Linen Fresh and I'd love something that smelled like Apple Pie or freshly mown grass." Leslie from Messy Blog UK loves Springtime at the moment and the Christmas ones! Hollie from ThriftyMum thinks that her favourite would have to be Linen Fresh but she'd love a waterlily and lime one like her fabric conditioner. Wow, there are some great ideas there! It certainly sounds like Linen Fresh is up there as a go-to favourite. I particularly like the sound of anything bakery inspired for use in my kitchen. Salted caramel would be awesome, particularly if it doesn't smell too sickly sweet. I think Zoflora is the Yankee Candle of the disinfectant market! For the moment, I will be enjoying using Lemon Zing and Lavender Escape - you can really smell the essential oils!